Law enforcement officials say the government kept hijacking ringleader Mohammed Atta's roommate from entering the United States on at least four occasions but didn't track his money transfers that led directly to the eventual hijackers. Officials say Ramzi Bin al-Shibh - named in court papers as an unindicted hijacking co-conspirator and the focus of a worldwide manhunt - intended to join the hijackers on their mission but shifted to providing logistical support when he couldn't get into the country. The Yemen citizen was refused a U.S. visa four times in 2000 because of suspicions he wouldn't leave America if he was let in. The officials, commenting on condition of anonymity, say FBI money tracking experts have reconstructed wire transfers Bin al-Shibh made from Germany and Yemen - some made using an alias - that went to the eventual hijackers and to one of the flight schools where they trained. The officials say two of those transfers went last summer to Zacarias Moussaoui, the man U.S. officials believe was chosen to replace Bin al-Shibh as a hijacker but who was foiled when he was arrested at a Minnesota flight school last August. Moussaoui is the lone defendant charged with conspiring with Osama bin Laden, Bin al-Shibh and the hijackers in the Sept. 11 attacks. Prosecutors are seeking the death penalty against him. This isn't the first time Bin al-Shibh's name has come up in the investigation. In testimony before Congress last February, Dennis Lormel, the chief of the FBI's financial crimes section, said that Bin al-Shibh, Atta and Marwin Al-Shehhi - another Sept. 11 hijacker - were members of an al Qaeda terrorist cell based in Germany. 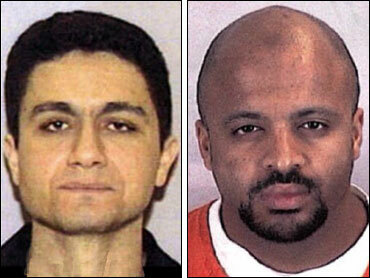 Lormel pointed to wire transfers from Bin al-Shibh to Moussaoui as evidence contributing to Moussaoui's indictment. Bin al-Shibh was also identified at that time as one of five men appearing in a video found in Afghanistan and released by the Department of Justice earlier this year, allegedly showing a discussion of preparations for the commission of terrorist acts. Bin al-Shibh was mentioned even earlier by FBI Director Robert Mueller, in the announcement last December of Moussaoui's indictment, which mentions Bin al-Shibh's role in funneling money to Moussaoui. Officials said Bin al-Shibh is now listed in the "tip-off" computer system that alerts the State Department and Immigration and Naturalization Service about foreigners who are believed to have ties to terrorist activities, countries and organizations. But they added the CIA had no information before Sept. 11 linking him to terrorism. Nonetheless, experts said Bin al-Shibh's actions highlight the challenges in stopping future terror attacks. His repeated failed efforts to enter the country did not trigger an investigation. And there was no effort to track his finances. When Bin al-Shibh failed to enter, Moussaoui was sent in his place and made it into the country with $35,000 in cash and a plan to train to fly jetliners, officials say. "This gets stranger and stranger," said Sen. Charles Schumer, D-N.Y., one of the senators investigating the terrorist attacks on the World Trade Center and the Pentagon. "Why we were able to keep Atta's roommate out, but not Atta and the rest of the terrorists, is beyond me." A State Department official said Wednesday there is still no mechanism, even in the aftermath of Sept. 11, to flag a foreigner who is turned down repeatedly for visas for suspicions like those that surrounded Bin al-Shibh. "It would be very difficult to draw a distinction between the typical profile of someone desperate to come to the United States for financial and social betterment reasons and is turned down several times for a visa and the terrorist or someone else with ill intent," said Edward Dickens, a spokesman for the consular affairs office that approves visas. Most of the money transfers from Bin al-Shibh came after U.S. officials rejected his first two requests for a visa to enter the country on May 17, 2000, and June 15, 2000, from Germany. He made at least two additional visa requests that also were rejected on Sept. 15, 2000, in Yemen, and Oct. 25, 2000, in Germany, records show. The official files show the State Department rejected Bin al-Shibh's visa requests each time because he "could not overcome the presumption" he wanted to overstay his visa, according to officials who have seen the file. Could not give a specific reason why he wanted to be in the United States and could not prove he intended to leave when his visa expired. Was born in Yemen, which is suspected of harboring terrorists and was the site of the 2000 USS Cole bombing linked to bin Laden. Despite the visa rejections, Bin al-Shibh went undetected as he began wiring money to the eventual hijackers. He kept most of the transfers below $10,000 - a limit that can trigger suspicious money reports to the government. And he used an alias to wire some of the money as Sept. 11 drew closer, authorities said. According to court documents and authorities who have researched Bin al-Shibh's background, the Yemeni citizen moved to Germany in the mid-1990s and worked at the same computer company as Atta in 1998 and 1999. The two shared an apartment in Hamburg, Germany. Federal prosecutors allege in court papers that Atta, Bin al-Shibh, and hijackers Marwan al-Shehhi and Ziad Jarrah "formed and maintained an al-Qaida terrorist cell in Germany" beginning in the late 1990s. Wired money July 26, 2000, from Germany to al-Shehhi in Florida, where he was attending flight school. Arranged Aug. 14, 2000, to wire money from his account in Germany to the account of a Florida flight training school where Jarrah attempted to enroll Bin al-Shibh for pilot lessons. Sent money Sept. 25, 2000, via wire transfer from Hamburg, Germany, to al-Shehhi in Florida. Received on July 30 and 31, 2001, two wire transfers from the United Arab Emirates in the amount of $15,000 and then on Aug. 1 and Aug. 3 wired $14,000 in money orders to Moussaoui in Oklahoma. For these transactions, Bin al-Shibh used an alias, Ahad Sabet, according to U.S. officials. None of the transactions were flagged by financial institutions, officials said.